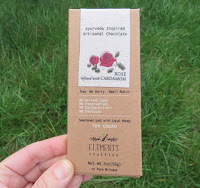 Today's Rose infused with Cardamom 70% Cacao bar was made by Elements Truffles (Kearny, NJ). 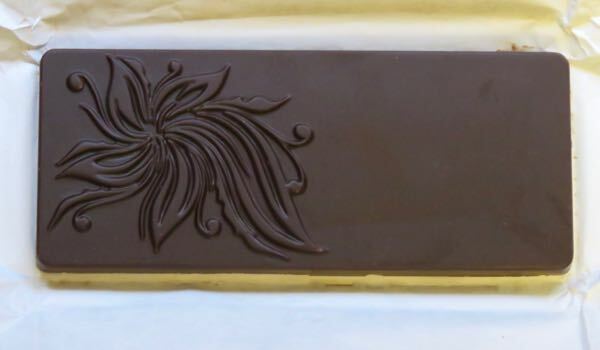 Like yesterday's Peppermint infused with Lavender bar (from the same company), this chocolate was well balanced and full of natural flavor. 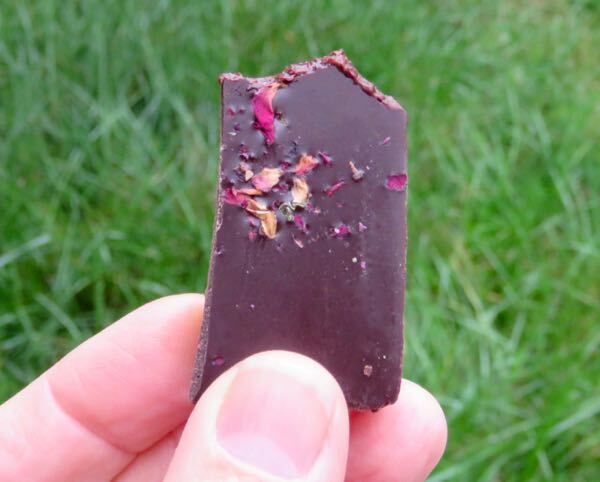 This bar had a beautiful aroma and flavor, with authentic, rose floral notes, and a hint of cardamom (think chai tea). The chocolate had a buttery/creamy melt and texture (cacao butter was the first ingredient), and a pleasing rose finish. The bar was "sweetened just with local honey," which gave it a more delicate quality (less of a sugar buzz) and contributed to a floral experience. Elements Truffles raw chocolate bars are handmade in micro batches without dairy, refined sugar, soy/emulsifiers or preservatives. Today's bar was made with Fair Trade organic cacao ethically sourced from Peru. Ingredients: organic raw cacao butter (Peruvian Criollo), raw honey, organic raw cacao powder, rose geranium essential oil, cardamom essential oil, organic rose petals, organic raw pumpkin seeds, Himalayan sea salt.